Schnitt geschliffener Massiver Marmor-Esstisch mit Glasplatte. 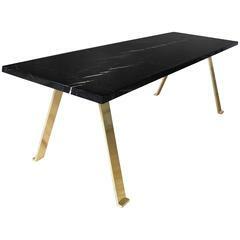 Sculptural side table carved from a solid block of nero marquina marble. Multiple pieces can be grouped together as a cocktail table. Available in custom sizes and shapes. We partner with clients to develop customized sculptural forms that can be carved in stone as unique one off pieces. Available in a variety of colored marbles. Please email for custom pricing on various stone options. Available in a wide variety of marbles in a range of different colors. Please contact the studio for more information and samples. Couchtisch / Beistelltisch Bronze und Marmor, limitierte Auflage, handgefertigte Bronze Basis, Marmorplatte. Side table in solid wood available in wenge or Canaletto walnut. Two different heights are available.